Business is booming as the Soho icon settles into its new LaBarge, Wyoming home. 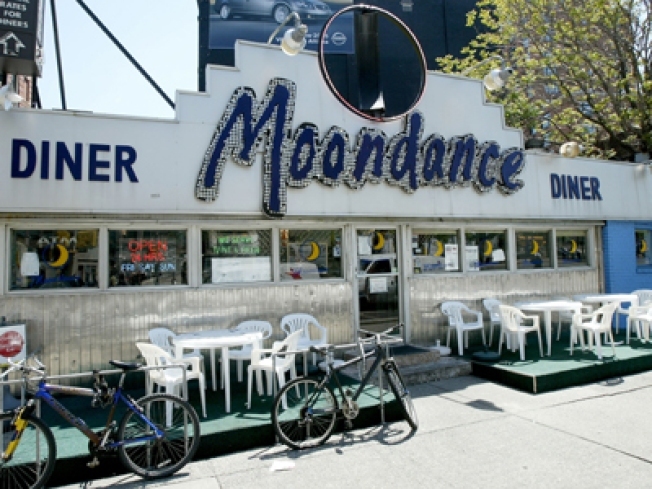 The Moondance in its original 6th Avenue spot. The diner is alive and well in its new home of LeBarge, Wyoming. Even when they were packing up 6th Avenue's storied Moondance Diner to ship it west, we were still a little incredulous. Shipping an entire diner? To Wyoming? Seriously? Then, when we saw the sorry state the diner was in upon arrival -- a little like casa Dorothy at the end of the Wizard of Oz -- we got even more cynical. No way anybody would try to turn that rusty, crumpled box into a full-fledged business. But new owners Cheryl and Vince Pierce -- who bought the diner for $7500 -- were fully committed to restoring the Moondance to its former glory. And looking at these images at Gothamist, we're happy to report our cynicism was entirely unfounded -- the photos show a very busy Moondance Diner, packed with patrons and serving up its beloved Blue Moon platters, in LaBarge, Wyoming.